The competition commences on 11/04/2019 at 9:00am AEDT and concludes on 08/05/2019 at 11:59pm AEDT. Entries must be received by the Promoter prior to the competition close date and time. Entrants are required to take full responsibility for the content of their entry and for ensuring that their entry complies with these terms and conditions. For the purposes of these content requirements, “entry content” includes any content (including text, photos, videos and email messages) that entrants submit, upload, transmit, publish, communicate or use in connection with their entry into the Promotion. Entries must be the entrant’s original work. The Promoter reserves the right to verify, or to require the entrant to verify, that the entry is the entrant’s original work. If an entry cannot be verified to the Promoter’s satisfaction, the entry will be deemed invalid.The Promoter may, in its absolute discretion, edit, modify, delete, remove or take-down any part of an entrant’s entry. The winner will be the valid entry submitted in accordance with these terms and conditions that is judged by taste.com.au editorial team to be the most original and creative at 10:00am (AEST) on15/05/2019 at 2 Holt St, Surry Hills, NSW 2010. If any particular determination is scheduled on a public holiday, the draw will be conducted on the following business day. The winner will be notified by telephone or email within five (5) days of the draw. 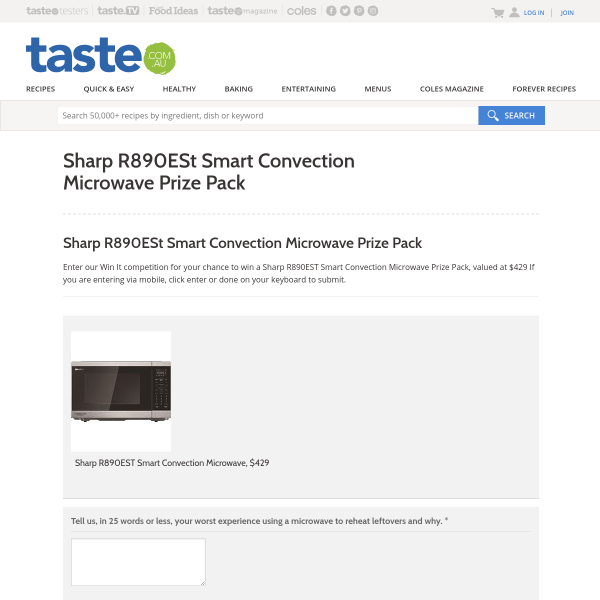 The winner of the prizes will be published online at www.taste.com.au within 7 days. Subject to State Regulations, any unclaimed prize draws will take place at 2 Holt St, Surry Hills, NSW 2010 at 10:00am AEST 3 months from when the initial winner was notified. The winner of the unclaimed prize draw will be notified by telephone or email within two days of that draw. The winner of the prize will be published on www.taste.com.au within 7 days of the draw.